39.2mm x 29.8mm 18K pink gold case set with 11 brilliant-cut diamonds, 9.5mm thick, sapphire back, 9-sided crown set with a brilliant-cut diamond, 18K pink gold bezel set with a brilliant-cut diamonds, sapphire crystal, silver dial set with brilliant-cut diamonds, self-winding movement with sword-shaped hands in blued steel, shiny bordeaux alligator skin strap. Water resistant to 30 metres. 30.2mm x 22.7mm 18K pink gold case set with 11 brilliant-cut diamonds, 7.19mm thick, sapphire back, 9-sided crown set with a brilliant-cut diamond, 18K pink gold bezel set with a brilliant-cut diamonds, sapphire crystal, silver dial set with brilliant-cut diamonds, quartz movement with sword-shaped hands in blued steel, shiny bordeaux alligator skin strap, ardillon buckle. Water resistant to 30 metres. 34.7mm x 26.2mm 18K pink gold case set with 11 brilliant-cut diamonds, 7.1mm thick, sapphire back, 9-sided crown set with a brilliant-cut diamond, 18K pink gold bezel set with a brilliant-cut diamonds, sapphire crystal, silver dial set with brilliant-cut diamonds, quartz movement with blued-steel sword-shaped hands, bordeaux alligator skin strap. Water resistant to 3 bar. 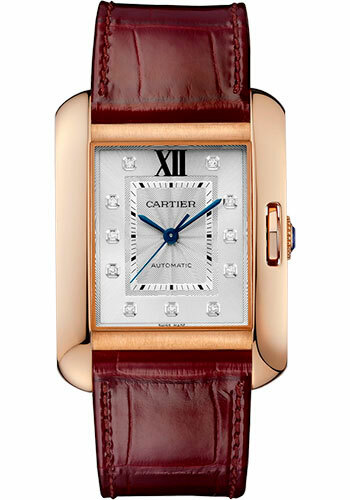 30.2mm x 22.7mm 18K pink gold case set with diamonds, 7.19mm thick, nine sided crown with a cut diamond, sapphire crystal, silvered dial with blued steel hands, caliber Cartier 057 quartz movement, claret red alligator strap, double adjustable deployant buckle with 18K pink gold. Water resistant to 30 meters. 39.2mm x 29.8mm 18K pink gold case set with diamonds, 9.5mm thick, nine sided crown with a cut diamond, sapphire crystal, silvered dial with blued steel hands, caliber Cartier 077 automatic movement, claret red alligator strap, double adjustable deployant buckle with 18K pink gold. Water resistant to 30 meters. 39.2mm x 29.8mm 18K pink gold case set with diamonds, 9.5mm thick, nine sided crown with a cut diamond, sapphire crystal, silvered dial with blued steel hands, caliber Cartier 076 automatic movement, claret red alligator strap, double adjustable deployant buckle with 18K pink gold. Water resistant to 30 meters. 47mm x 36.2mm 18K pink gold case set with diamonds, 9.82mm thick, nine sided crown with a cut diamond, sapphire crystal, silvered dial with blued steel hands, caliber 1904 MC automatic movement, claret red alligator strap, double adjustable deployant buckle with 18K pink gold. Water resistant to 30 meters. 34.7mm x 26.2mm 18K pink gold case set with brilliant-cut diamonds, 7.1mm thick, 9-sided crown set with a brilliant-cut diamond, 18K pink gold bezel set with a brilliant-cut diamonds, silver dial set with brilliant-cut diamonds, quartz movement with blued-steel sword-shaped hands, shiny bordeaux alligator skin strap. Water resistant to 3 bar.